“It is with complete confidence that I highly recommend Dr. Shah of the VIBB. I suffered with unsightly and painful varicose veins for many years. When my condition finally began to seriously impact my everyday life, I knew it was time to address the issue. After an exhaustive search, I knew I had found the right doctor for me in Dr. Shah. Of course, he was knowledgeable & competent. But, more than that, he was compassionate, patient, & encouraging. He explained all my options, answered all my questions, and addressed all my fears. He put me at ease, & I never felt rushed or hurried. He routinely went above & beyond the call of duty in his care of me. The staff was great, always handled all of my questions or concerns about upcoming appointments, surgeries, or insurance issues in a timely manner. I felt they genuinely cared. I never felt uncomfortable about calling with yet another question. The facility in Blue Bell is beautiful, state-of-the-art, and very centrally located. There’s plenty of parking, and it’s an easy drive from just about anywhere. “My veins have been bad since I have been a teenager. I inherited them from my mom. I was so self conscious of them that I never liked to wear shorts or a skirt. I decided to try the Vein Institute. 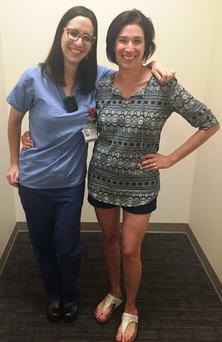 Dr. Yedida Goldman with Tina B. immediately after her VenaSeal procedure. The smile says it all!